Posted below are documents and maps referenced in On Waterloo: Clausewitz, Wellington, and the Campaign of 1815, but which could not be included in the printed book. These include the published German text of Der Feldzug von 1815 in Frankreich, in Hinterlassene Werke des Generals Carl von Clausewitz über Krieg und Kriegsführung (Berlin: Ferdinand Dümmler, 1835/1862) and Lord Liverpool's partial translation given to Wellington. 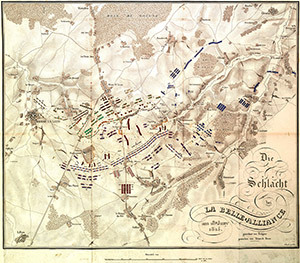 Clausewitz's original study of the Waterloo campaign contained no printed maps, but it referred to a set of maps in an atlas prepared by the Prussian General Staff in the 1820s, August Wagner's Plane der Schlachten und Treffen welche von der preussischen Armee in den Feldzügen der Jahre 1813, 14 und 15 geliefert worden, 4 volumes (Berlin: G. Reimer, 1825). The printed version of On Waterloo: Clausewitz, Wellington, and the Campaign of 1815 contains details from two of those maps. On this internet page, however, we are able to include images of the complete maps, plus a few other maps from various sources that may be helpful to readers. NOTE: Each link will open in a new window. Above: Map of north central Europe at the beginning of 1815. 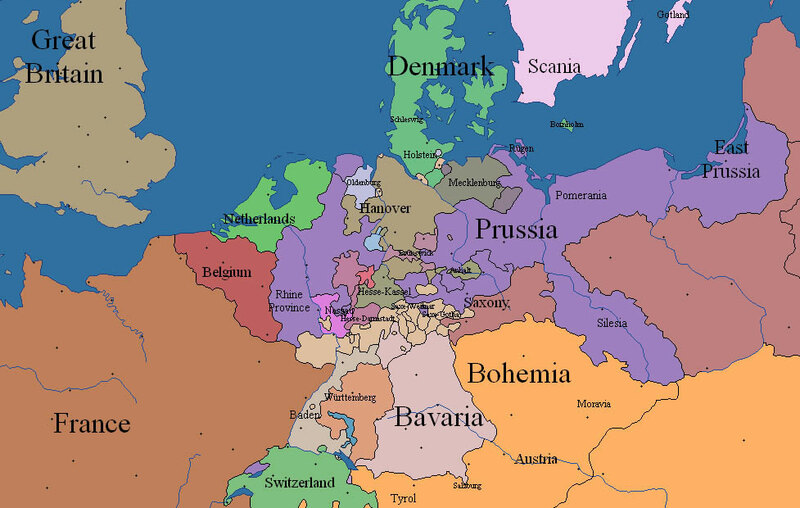 From The Centennia Historical Atlas, a computerized, map-based guide to the history of Europe and the Middle East from the beginning of the 11th century to the present. Centennia is a dynamic, animated historical atlas including over 9,000 border changes. Posted here with the permission of Centennia Software. NOTE: The free version of the Centennia Historical Atlas covers the French Revolutionary and Napoleonic Era from 1789 to 1819. The image will open in a new window. 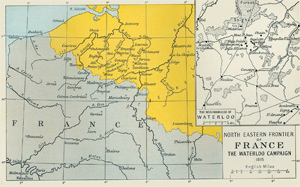 Above: Map, North Eastern Frontier of France: The Waterloo Campaign, 1815. From The Cambridge Modern History Atlas, eds. Sir Adolphus William Ward, G.W. Prothero, Sir Stanley Mordaunt Leathes, and E.A. Benians (London: Cambridge University Press, 12). From the maps collection of the University of Texas at Austin. The image will open in a new window. 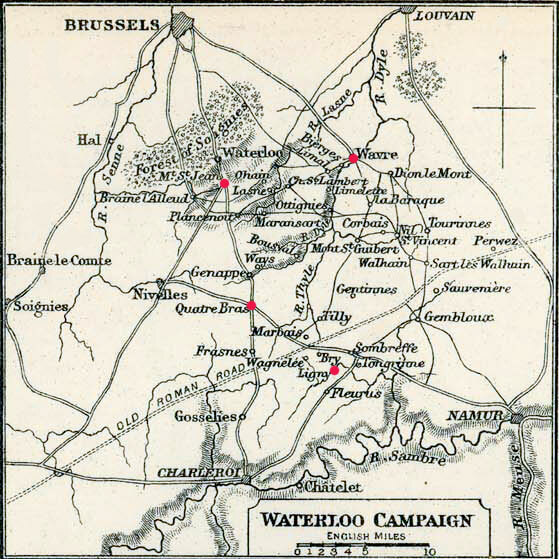 Below, see a map of the immediate vicinity of the Waterloo campaign's principal battles. Original source: Charles Colbeck, The Public Schools Historical Atlas (London: Longmans, Green, 1905). From the maps collection of the University of Texas at Austin. The image will open in a new window. 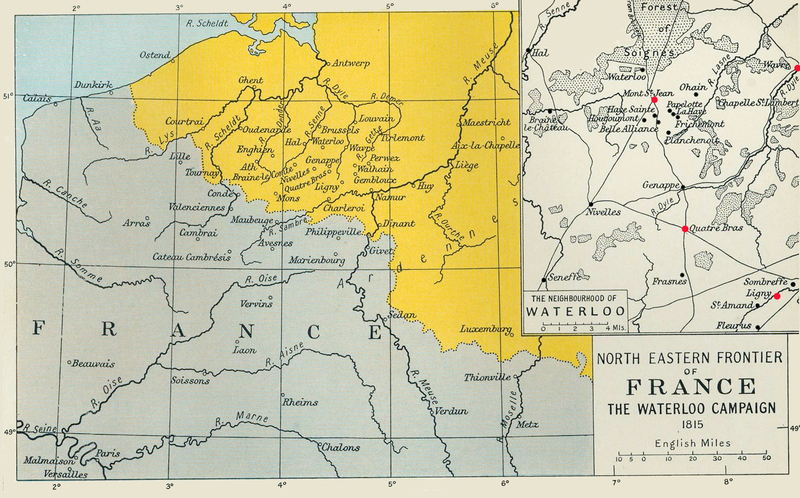 These two maps are included in the book On Waterloo for the convenience of readers. However, they have no direct connections to the comments of either Clausewitz or Wellington. 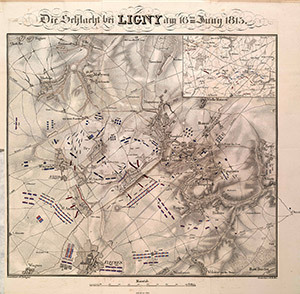 Above: Map, Battle of Ligny, 16 June 1815, with flap showing key tactical movement closed. From August Wagner's Plane der Schlachten und Treffen welche von der preussischen Armee in den Feldzügen der Jahre 1813, 14 und 15 geliefert worden, 4 volumes (Berlin: G. Reimer, 1825.) Posted here with the permission of the curator of Special Collections, Florida State University Library. [JPG, 1.48mb] The image will open in a new window. Above: Map, Battle of Ligny, 16 June 1815, with flap showing key tactical movement raised. From August Wagner's Plane der Schlachten und Treffen welche von der preussischen Armee in den Feldzügen der Jahre 1813, 14 und 15 geliefert worden, 4 volumes (Berlin: G. Reimer, 1825.) Posted here with the permission of the curator of Special Collections, Florida State University Library. [JPG, 1.48mb] The image will open in a new window. Above: Map, Battle of Belle-Alliance (Waterloo), 18 June 1815. From August Wagner's Plane der Schlachten und Treffen welche von der preussischen Armee in den Feldzügen der Jahre 1813, 14 und 15 geliefert worden, 4 volumes (Berlin: G. Reimer, 1825.) Posted here with the permission of the curator of Special Collections, Florida State University Library. [JPG, 1.76mb] The image will open in a new window. 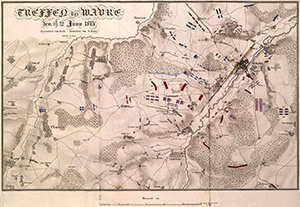 Above: Map, Battle of Wavre, 18-19 June 1815. From August Wagner's Plane der Schlachten und Treffen welche von der preussischen Armee in den Feldzügen der Jahre 1813, 14 und 15 geliefert worden, 4 volumes (Berlin: G. Reimer, 1825.) Posted here with the permission of the curator of Special Collections, Florida State University Library. [JPG, 2.6mb] The image will open in a new window. 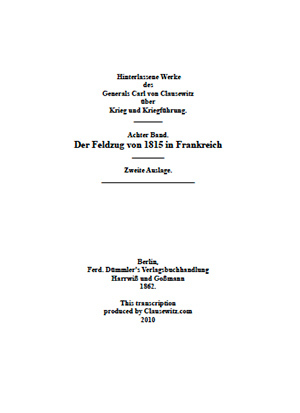 Above: Full text, Carl von Clausewitz, Der Feldzug von 1815 in Frankreich, Zweite Auflage, (Berlin: Ferdinand Dümmlers, 1862). © Clausewitz.com. Transcribed from the German original (printed in a Fraktur typeface) by Ms. Toni Mortimer, of the Ohio State University. 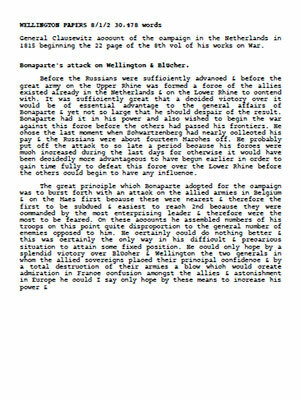 [PDF, 638kb] For a PDF of this edition as printed in 1862, click here. The PDF will open in a new window. 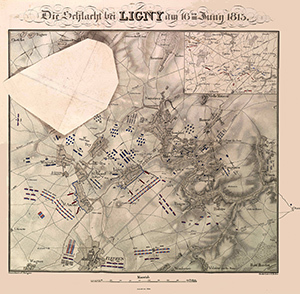 For the most accurate and scholarly edition (based on Clausewitz's own manuscripts), see Feldzug von 1815: Strategische Uebersicht des Feldzugs von 1815, in Carl von Clausewitz, Schriften – Aufsätze – Studien – Briefe, 2 volumes in 3, edited by Werner Hahlweg (Göttingen: Vandenhoeck & Ruprecht, 1966-90), volume 2, part 2: 936-1118. Above: Transcription by Mrs. Noran V. Stocks of the manuscript translation by Cecil Cope Jenkinson, 3rd Lord Liverpool, of Carl von Clausewitz, Der Feldzug von 1815 in Frankreich (Berlin: Ferdinand Dümmlers, 1835). Papers of the first Duke of Wellington, University of Southampton, Folder 8/1. © Clausewitz.com. Posted here with the permission of the University of Southampton. [PDF, 272kb] The PDF will open in a new window. 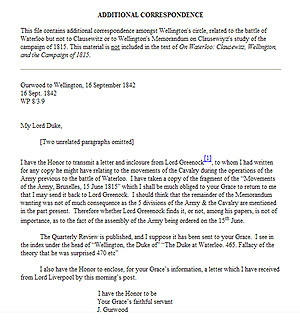 Above: Additional correspondence amongst Wellington's circle, related to the battle of Waterloo but not to Clausewitz or to Wellington's Memorandum. This material is not included in the text of On Waterloo: Clausewitz, Wellington, and the Campaign of 1815. The page will open in a new window.